Sim-Plex has transformed a 606 sq. 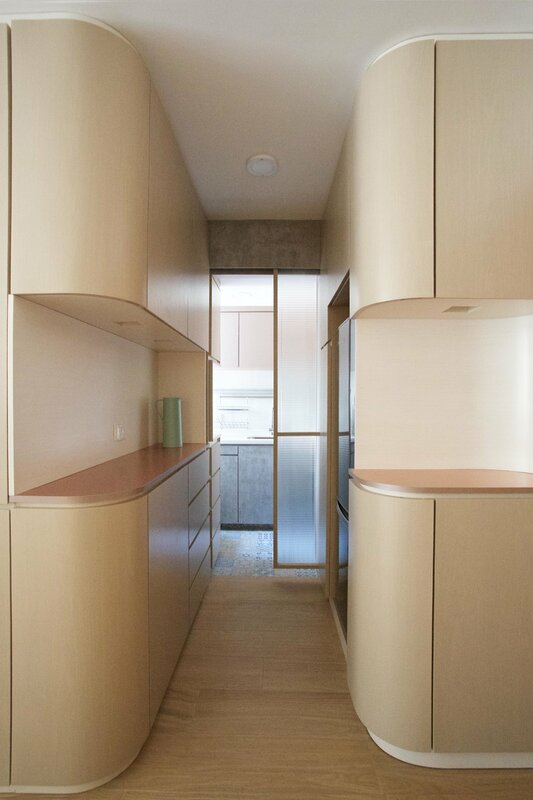 flat in Hong Kong into a combined living & working studio, with a clustered of arc frame and round-corner cabinetry to form a village- like communion. Client inspiration - As described by the client, the situation is very bad in the past. The working room is enclosed, isolated and fenced off from the living room without any sunlight. The client is an IT self-employer and he complained that the previous spacial arrangement make him lack of communication with his family members. Moreover, all the paper documents were exposed and look messy. The living room is full of debris and look untidy.
" Fluidity, openness, brightness and tidiness" as suggested by Sim-Plex to client, are the wordings which would be achieved in this project. Concept of arc village - " Village is a clustered of human settlement and symbolize for a communication of space. In our mind, we've got a simple and poetic image with a few village house surrounded by a little creek; a full moon is appeared to shine and light the skies, creating a dancing shadows of trees. " said Sim-Plex Design Studio. 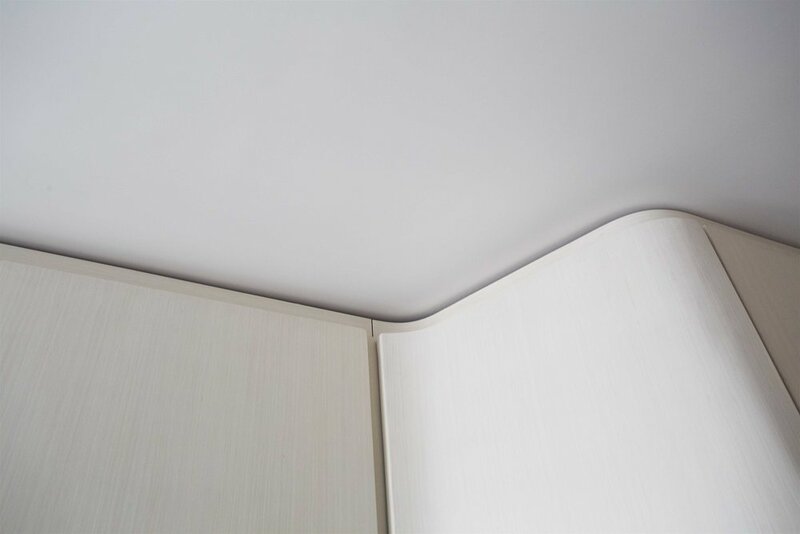 Arc and round corners enhanced the fluidity and smoothness of the space, create a working space connecting with the living room harmoniously. Most of the brick wall previously was demolished and the adoption of open plan for work and live help admitting most of the natural light and create the depth of space.
" Work in Home " Phenomenon - " Hong Kong is famous for its expensive cost of rent and this create a trend of working co-exist with living to help save the cost recently. However, many of the cases have sacrificed the spacial quality of both area. From the view of Sim-Plex, working studio could be bright and opened up to living space but in a way the privacy of working would still be retained. Could this project demonstrate the quality which work and live is connecting harmoniously? " said Sim-Plex Design Studio. Project innovation - In the main room, an village house- shaped arc frame seating on a bar table act as a gateway connecting the working and living space. All the windows are opened up into the room to maximize the daylight. Round corner wooden cabinetry is wrapping up every space to hide all messy storage and create scattered wooden block in a mood of village. Mable finish wall, dining table and sliding table act as a highlight of the space. 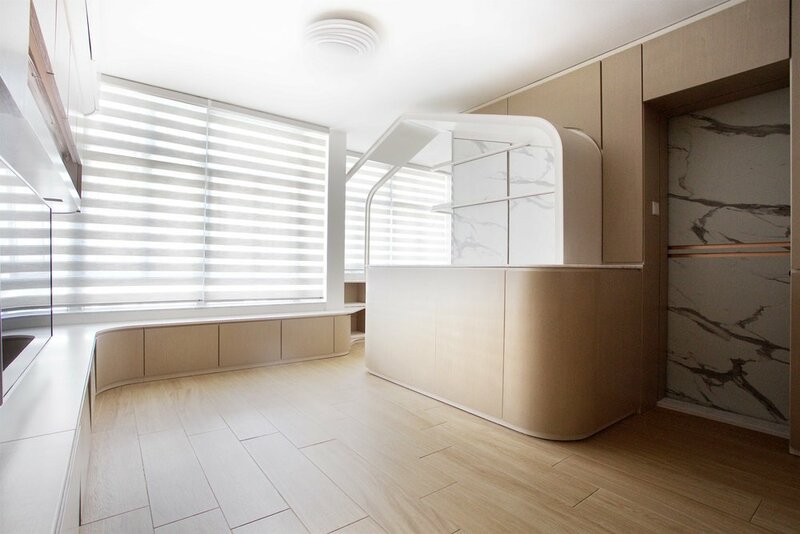 The working space is located at the end of the room and so certain privacy is retained, at the same time, the working desk is in a location which still could spot the TV. 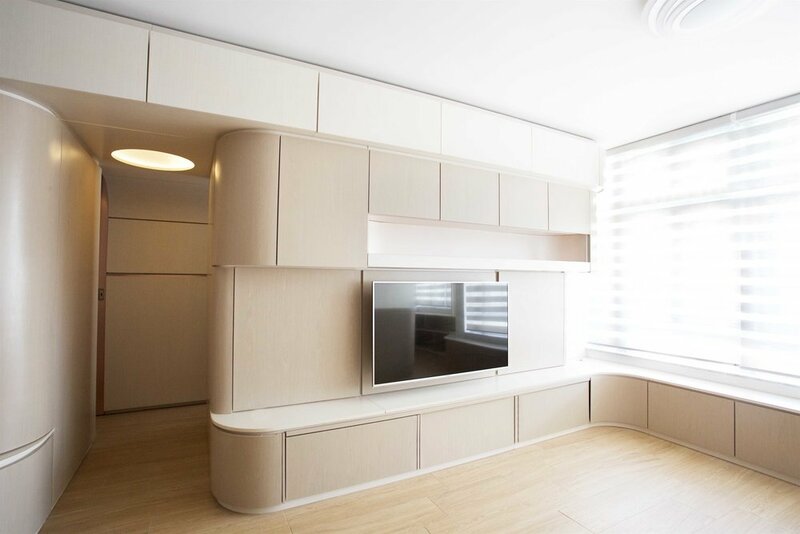 Under the window, an curvy seat- level cabinetry is elongated from the working space and transformed into the TV cabinetry of the living room. Slots with lighting and copper platform are integrated to allow more display area. 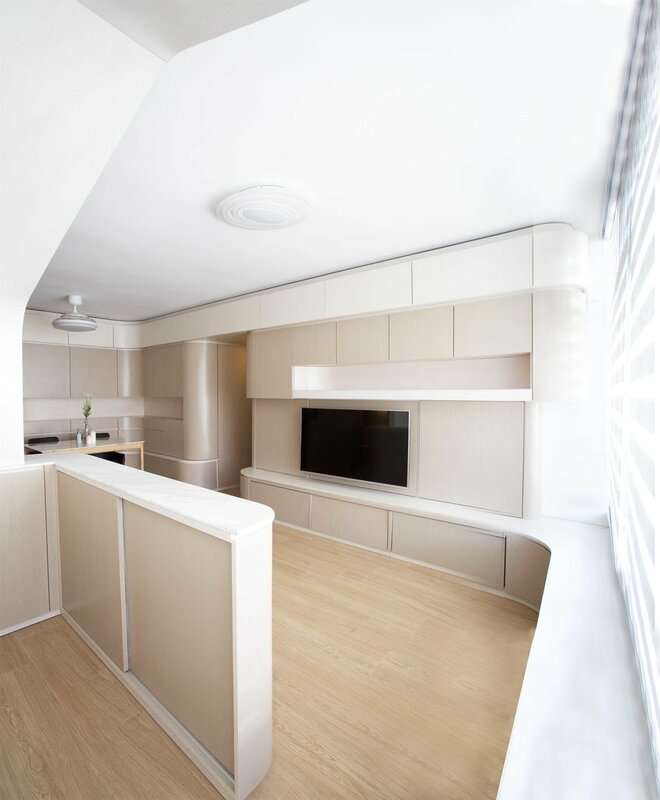 In the corridor, a tree- like white wooden enclosure is wrapping from the corridor and extending into the top cabinetry of the living room. 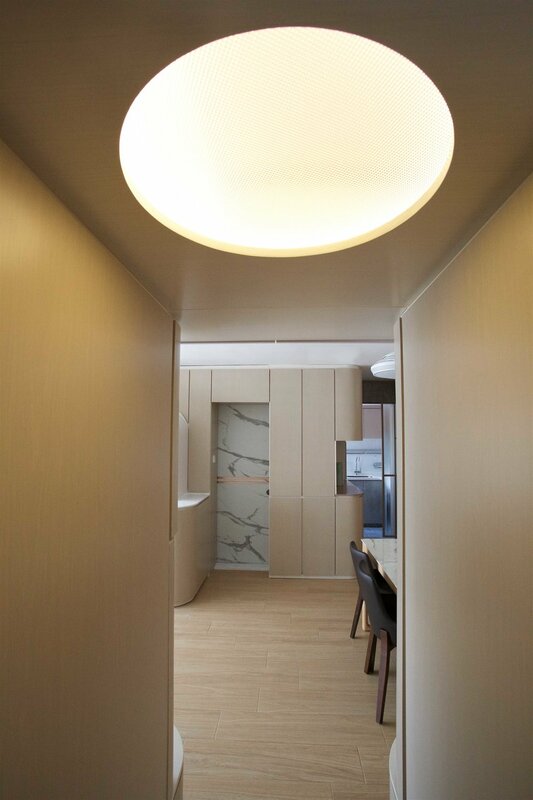 A " full- moon " lighting is integrated in the roof cabinet in corridor to light up the space. In kitchen, a semi foyer is created to serve as a supportive space for the kitchen. Storage like rice cooker, boilers, etc could be placed at the slot. A fritted-line glass sliding door is hidden within the wooden cabinetry. 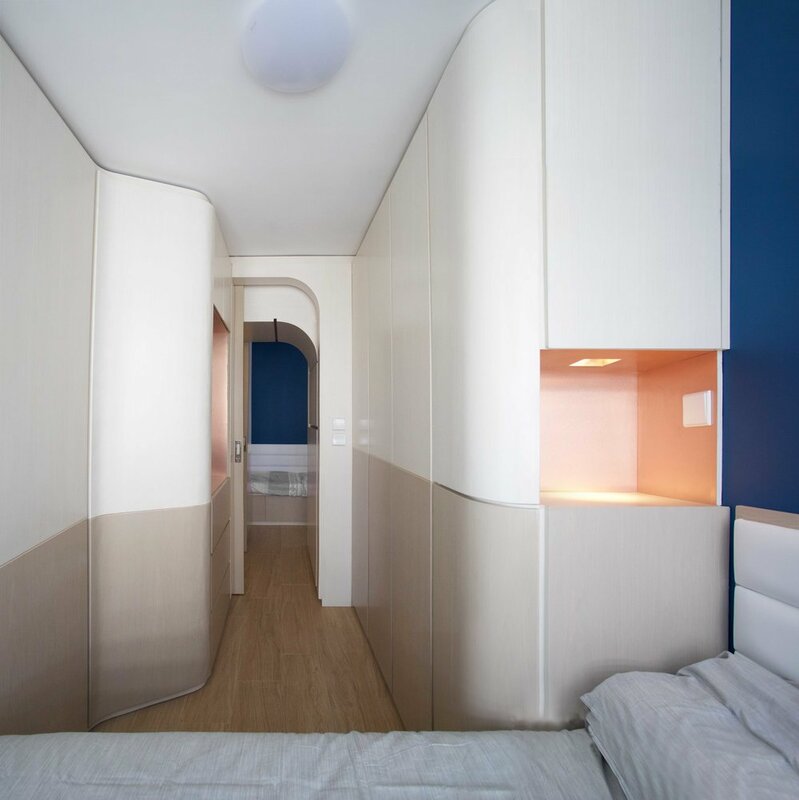 In the master and daughter bedroom, dark blue wall- paint is highlighted as a feature of space . No brick wall is built between the rooms, but instead, curvy wooden cabinetry with different copper finish voids is help defining the space and creating privacy. The toilet is hidden within the round corner cabinetry with the marble finish sliding door as the highlight. Through the concept of arc village, a bright, fluent and poetic space is created to enhance communication between family members and allow the co-existence of work and live harmoniously .